Text "Summer Meals" to 97779 for a free summer meal location near you! This site includes date of operations, meals available at each location, meal times and more. Read more information about summer feeding on our blog. Please arrive as close to the feeding time listed as possible. All food must be eaten on site. Below is the summer schedule for Big Red READS. Big Red READS is a mobile library that brings books to our K-12 students during the summer months. It is a very rewarding experience to connect with our students in the summer and to promote their continued growth as readers! NEW this year: Parent Resources will also be available for checkout. Big Red READS is entering its 8th year. To date, we have given away more than 11,000 books and had more than 4,000 student checkouts of leveled texts. We need your help to make this summer as successful as years past! If you would like to volunteer during the summer please contact Alice Ensley with the dates you are available. Volunteers meet at the location and help load and unload the bus. Volunteers help students select books and manage check out. Thanks so much for supporting our students ALL year! Look for Big Red READS between 11:30-12:30 and get books to keep you reading all summer! Wednesday, June 13 Veterans Park Corner of Veteran's Dr. and Mitchell St.
Wednesday, July 11 Veterans Park Corner of Veteran's Dr. and Mitchell St. Pick up your book on June 4, 6, 11 or 16 at a Big Red Reads Location. Join us at Sonic on Cleveland Highway for Book Club and snacks! Hating her family's taco truck and wishing that her father would take a "normal" job, Estefania becomes the truck's unlikely champion when her family's livelihood is threatened. 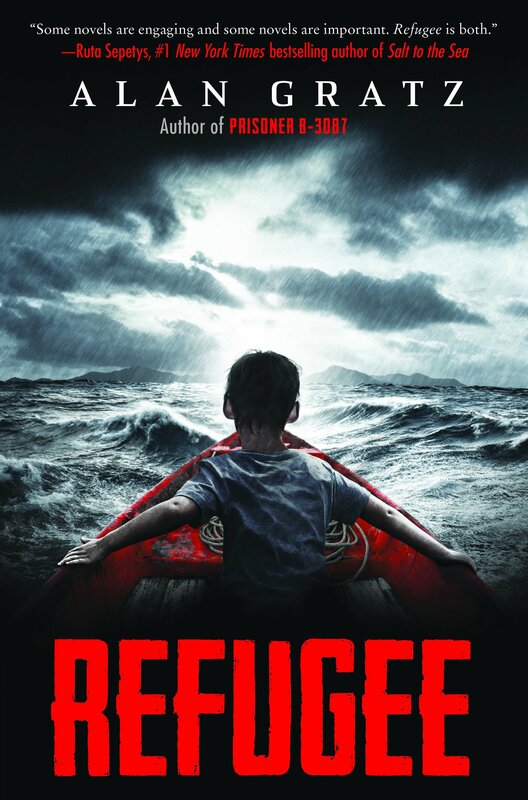 All three kids go on harrowing journeys in search of refuge. All will face unimaginable dangers -- from drownings to bombings to betrayals. But there is always the hope of tomorrow. And although Josef, Isabel, and Mahmoud are separated by continents and decades, shocking connections will tie their stories together in the end. This action-packed novel tackles topics both timely and timeless: courage, survival, and the quest for home. But it turns out A.J. likes not Gracie but Gracie’s beautiful best friend, Sienna. Obviously Gracie is happy for Sienna. Super happy! She helps Sienna compose the best texts, responding to A.J. 's surprisingly funny and appealing tests, just as if she were Sienna. Because Gracie is fine. Always! She’s had lots of practice being the sidekick, second-best. It’s all good. Well, almost all. She’s trying. Funny and tender, Well, That Was Awkward goes deep into the heart of middle school, and finds that even with all the heartbreak, there can be explosions of hope and moments of perfect happiness. To see this chart in Spanish, click here. 8:30 a.m. - 3 p.m. Contact school counselor or social worker or call Family Support council. All children at all locations (Limited spots) 1 - 12 $30 - 60 per week. Some partial scholarships available. June 4 - July 27 Go to Boys and Girls Club at 1013 Underwood St. 7:30 a.m. - 6 p.m. Registration is $30 (can be waived). 7 a.m. - 5 p.m. Call or stop by Community Center to register. Creative Arts Guild (Music, Dance, Art and gymnastics) 706-529-3442 or www.creativeartsguild.org All Children Ages Depends on camp Cost Depends on camp. Different for each camp. Call or visit www.creativeartsguild.org to learn more. Lisa Hughey Students with a diagnosis of mild to moderate disabilities Ages 5 - 8 and 9 - 15 TBA TBA Go to Dalton Parks and Recreation on Civic Drive to register. Whitfield/Murray Historical Society 706-278-0217 Boys & Girls 4th - 8th Grade $45, or $35 for siblings July 24 - 26 Call to register. Creative Discovery Museum Camps Nancy at (423) 648-6045 or Sheila at (423) 648-6040. Varies 4 - 5, 8 - 12, 5 - 12 Varies Varies Visit full list here. Grace Presbyterian Sports Camp 706-226-6344 Boys and Girls 1st - 8th Grade $10 per week. Morning Session: 8:00 - 11:30 a.m.
*Courses will be delivered through the OdysseyWare online curriculum with a certified teacher present in the lab. Note: Students may start an additional course for credit recovery if the first O.W. course is completed prior to June 25. Additional charges will apply. Courses may not be carried over beyond summer school. Incomplete courses will earn failing grades. Sesión de la mañana: 8 - 11:30 a.m.
DEBE INSCRIBIRSE EN PERSONA Y PAGAR al momento de la inscripción. * Currículo con un maestro certificado presente en el laboratorio. Nota: Los estudiantes pueden comenzar un curso adicional para recuperación de crédito si el primer curso de O.W es completa antes del 25 de junio. Adicional: Se aplicarán cargos por cursos adicionales. Los cursos no pueden seguir más allá de la Escuela de Verano. Escuela de Verano: Los cursos incompletos obtendrán calificaciones reprobadas. Swimming pools are the most common site for a drowning to occur for children ages 1 to 4. 5,209 children in U.S. will sustain nonfatal near drowning-related injuries this year. 89 percent of boating deaths of all ages occurred on boats where the operator had not received boating safety instructions. The majority of infant drowning deaths happen in bathtubs or large buckets. African-American kids ages 5 to 14 are almost three times more likely to drown than white children. The use of specially made drain covers, safety vacuum-release systems, multiple filter pumps and other pressure-venting pool filter mechanisms can reduce the risk of entrapment in pools. Close toilet lids and use toilet seat locks to prevent drowning. • Children thirteen years and older, who are at an adequate level of maturity, may be left alone and may perform the role of babysitter, as authorized by the parent, for up to twelve hours. • It may not be advisable to leave an older child who has a special condition or disability alone. 1) Does the child know the emergency plan for the family? 2) Does the child know the parent's phone numbers (work and home)? 3) Can the child demonstrate the plan and recite the numbers? 4) What is the availability of the parent during this time? 5) Are there environmental factors that add further risk to the situation? 6) Are there factors that reduce risk, i.e. supportive/available neighbors? If you have questions and want to talk to the local Whitfield DFCS Office, please call 706-272-2834. If you suspect child abuse or neglect, please call 855-GA-CHILD. CLICK HERE FOR FURTHER SUMMER RESOURCES FROM GET GEORGIA READING! You can search from more than 50 different categories and genres, fiction and nonfiction, picture books, graphic novels, chapter books, titles for struggling and reluctant readers and Spanish and bilingual titles. It’s like having your own personal library right at your fingertips. Send your reviews, videos, photos and more to Bill Valladares at william@gafcp.org, and be sure to use the hashtags #GetGAReading and #myON with your social media posts. NWGA Library staff will host five visits for the program, starting at 11 a.m. Laptops will allow students to check out books from their library and allow parents to sign up for library cards. The library staff will also be holding a reading challenge for older children. Interpreters will also be available. The program is every Wednesday in June at 11 a.m. and one Saturday in June. Dates are listed below with their performers. Library will be giving books every week to children that attend the program.